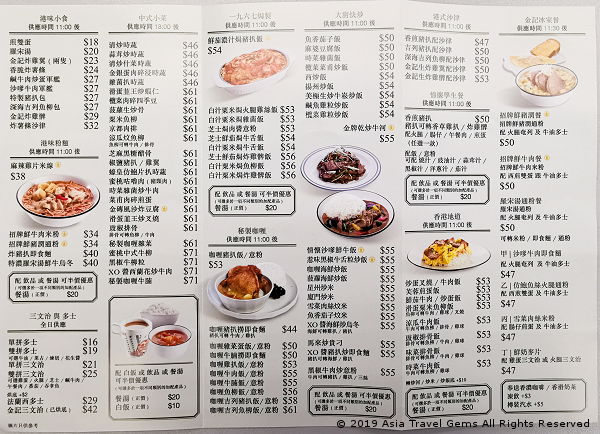 Searching for great tasting local Hong Kong Food? Then look no further. 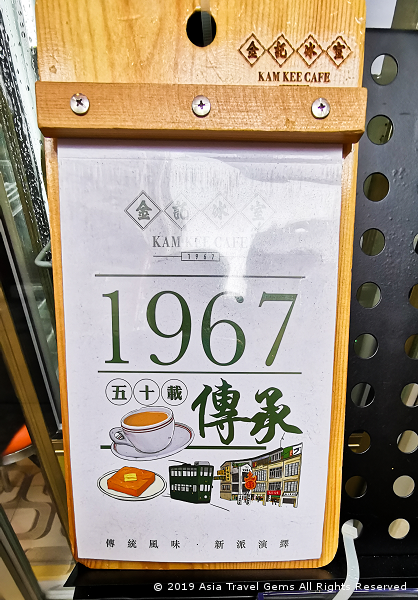 Kindly allow me to introduce to you Kam Kee Cafe – Awesome Authentic Cha Chaan Teng Food! It was just after 1 pm. And I finally arrived at the Butterfly on Morrison Boutique Hotel. But, check in time was at 2 pm. The friendly staff at the front desk gently informed me that my room was not ready yet. She suggested that I go for lunch, and return later. That was a good idea as I was already feeling hungry. I asked her where would be a good place to enjoy good food nearby? She asked me what type of cuisine I would like to have? There were Italian, American, and of course, local. I chose local. She recommended Kam Kee Cafe. The cafe was just a few minutes walk away from the hotel. And she promised me that the food is really good. I smiled, and thanked her as I set off with great anticipation. I was not disappointed. Continue reading to find out how good the food was. With my new Huawei Mate 20 Pro, I took a video of Kam Kee Cafe. You get to see from outside to inside. Plus, menu and few of the dishes I enjoyed. Watch now! 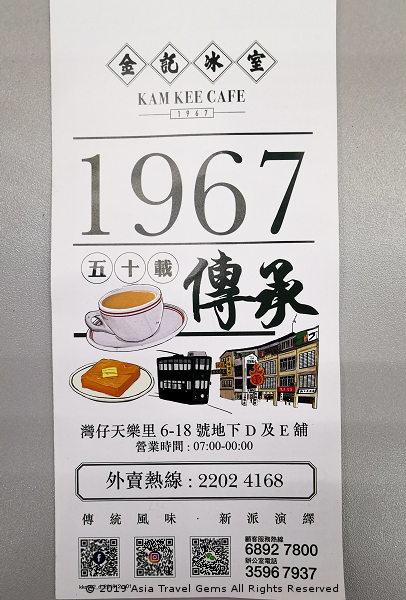 The story of how Kam Kee Cafe came about is fascinating. The original owner, Chan Gui Chou, arrived in Hong Kong in the 1950s. He started the eating place in 1967. The recipes have not changed since. Even today, the current owner has maintained the integrity and standards of those same dishes served since 1967. He did add a dinner menu. Only because of high rent that required this small change, and longer operating hours. Not that anyone is complaining. Especially since we get to enjoy more good food from this cafe. If you don’t know Chinese words, the cafe may be a little hard to find. That is why I have the video above to help you locate it. And this little screen shot below, too. It looks like a little small shop from the outside. And in fact, it is only taking the space of one shop. This is why it looks small, and may be hard to find if you don’t know what to look out for. Inside, the cafe’s space is long. And that is why they can accommodate quite a lot of people. Check out the video above to see what it looks like on the inside. Outside the cafe, there are posters and standing displays of their menu and popular meals. You can’t miss seeing them. 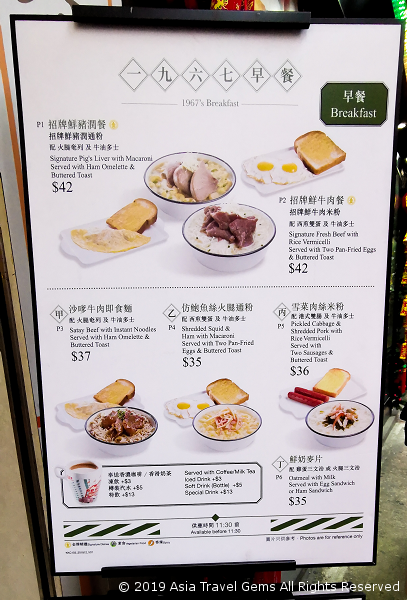 Shown below is the upper part of the standing display that shows the breakfast sets available. The photo below is the lower part of the standing display that is promoting their popular morning breakfast. I had the Fish Fillet with Eggs and Toast. I share more about this set meal further down this article. At the entrance, there are posters to promote more meals. Not sure what to have? Choose any of the Top 10 Signature Dishes. You can’t go wrong. Kam Kee Top 10 Signature Dishes Signage. Choose any of these and you can be sure you get the best tasting food here. 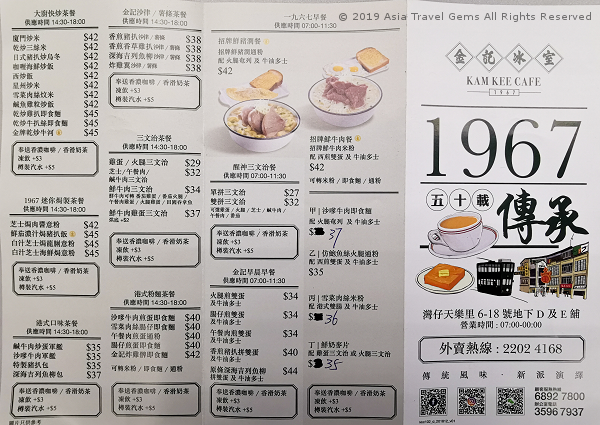 As mentioned earlier, the menu and recipes of the dishes at Kam Kee Cafe have not changed since 1967 when it first started. And that is a good thing. This is because the food is really good. The cafe is what is known as a Cha Chaan Teng. And the food served is Cha Chaan Teng style. Earlier on, I was introduced to Kam Kee Cafe by the hotel front desk. As I stepped in through the entrance, I was a little shy and unsure of how things work. In addition, it was lunch time. The cafe’s peak hour. There was already a lunch crowd. Every table was filled or almost filled with customers. It can be quite intimidating. Fortunately, the wait staff were very friendly. They asked me how many people in my party. I indicated just one – me. Then they encouraged me to find any empty seat. The pointed to one where a young Caucasian guy sat alone in a table for four. Ahhh. I soon realized. This is how it is in Hong Kong. Just join in at any table. As long as the seat is available. I asked the guy if it is all right for me to join him at the table. He smiled and nodded, waving his hand to an empty seat, inviting me to join him at that table. There is actually a lot of choices. And I soon noticed that there are dishes for breakfast, and some for after 11 am. Below is a list of the Top 10 Signature Dishes they offer. Top 10 Signature Dishes by Kam Kee Cafe – The Best of The Best! They have set meals that come complete with eggs and toast. Plus for just a little extra, you can have a drink. The choices are coffee, tea, soft drinks, etc. Most people choose the popular Hong Kong Milk Tea (more about this awesome drink further down). If you arrive after 11am, do note that not all the dishes are available. Look for the menu choices under the list stated as Available after 11 am. See the image below to see what I mean. Of course, this After 11 am list is not just these two pages that you see in the above image. There are few more pages with lots of choices. 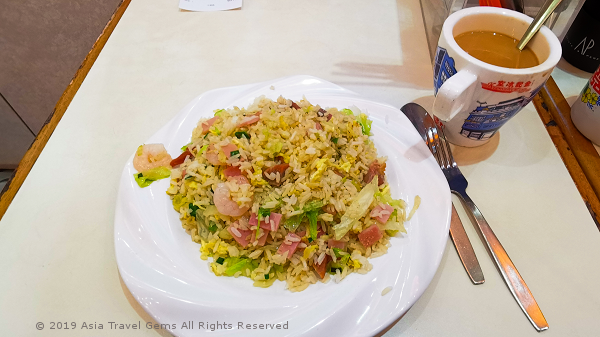 For example, the Yong Chow Fried Rice with Hong Kong Milk Tea set that I had. The Yong Chow Fried Rice was one of the best I had in a long while. And that included Singapore and other countries I have visited the past few years. The shrimps were fresh, bouncy and juicy. The ham, Chinese sausage, lettuce and fried egg added a delightful combination that made every bite a gastronomical pleasure. So, how did I order? It was easy. I can speak Cantonese and Mandarin. But I am not that fluent. So to save any embarrassment, I spoke English. And the wait staff spoke and understood English too. At the same time I pointed at the food and drink I desired so that there can be no mistakes. The food was so good that I went back a few times to try more of their delicious food. 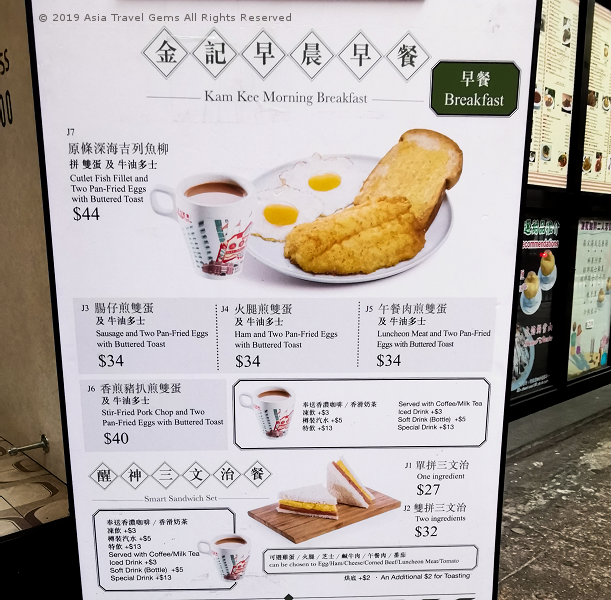 Here is the breakfast set that comes with toast, fried eggs, deep fried fish fillet and of course the Hong Kong Milk Tea. The Fish Fillet is a real treat! The slice of fish is thick and moist, with a nice flavor. The crust is a thin and crispy. Every bite is so enjoyable as I cut through the crust easily with my teeth and then sink into the moist and juicy fish inside. Tip: While the fried eggs are nice, do ask for scrambled eggs. They do that so much better in Hong Kong. The macaroni with ham and cheese is also a popular dish. Many locals enjoy this for breakfast or lunch. To be honest, I do not find this anything special. But I do understand the emotions connected with this dish. The simplicity and flavor brings back memories of the 60s, and the feelings of the good old days. I miss this lovely concoction. I truly believe there must be a special kind of tea they use, and a specific percentage of evaporated milk to create this unique tea. If you are too busy or simply wish to have some good food in the comforts of your hotel room, you can order from the cafe, and have the food and drinks delivered to your room. Here is the cover of the delivery menu. And the inside and back of the cover that contain the list of food and drinks. Personally, I would much prefer to dine in. The atmosphere, the service, the customers. All that add to the dining experience. At the same time, I do get this delivery option. Most people working in Hong Kong may not wish to go out for lunch. It can get very crowded. So, it is much more relaxing to eat in the office kitchen or pantry. Also, there are private apartments in this area. Some people may like to have their dinners sent to their homes, and enjoy it comfortably there. The food served here at Kam Kee Cafe is really good. Very delicious! And the Hong Kong Milk Tea is flavorful. Not as great at the one served at Honolulu Cafe. But still just as delectable. 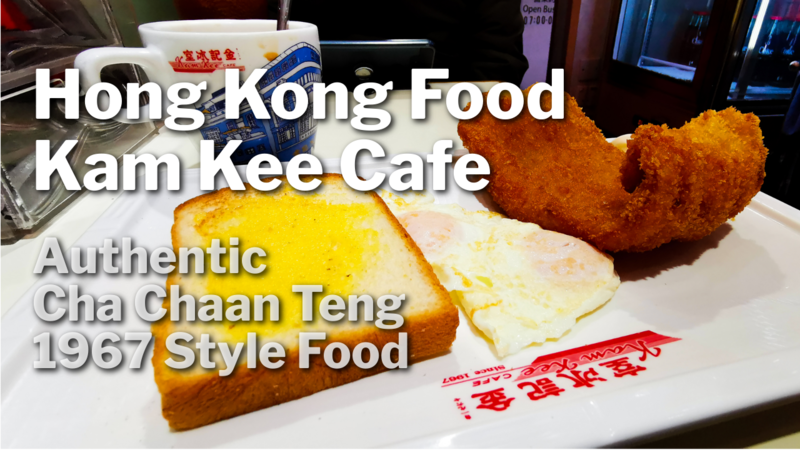 If you yearn for local food, or Cha Chaan Teng food, then you must try Kam Kee Cafe. I would definitely recommend the same dishes I tried. The Fish Fillet set is really awesome! The Yong Chow Fried Rice is so tasty! I have said it all above. There is one dish that I did not have the time to try but I wish I did. It was one of the Top 10 Signature Dishes, and it was the Baked Tomato Pork Chop with Rice. On my first visit there, the Caucasian guy had this. And it smelled so good! It is definitely on my list of food to eat the next time I am in Hong Kong. Where is Kam Kee Cafe? Kam Kee Cafe has many branches. The one that I frequented was along Tin Lok Lane. The reason I came to this branch so often is due to convenience. It was near the hotel where I stayed at. And it was one of the perfect places to go to for breakfast. 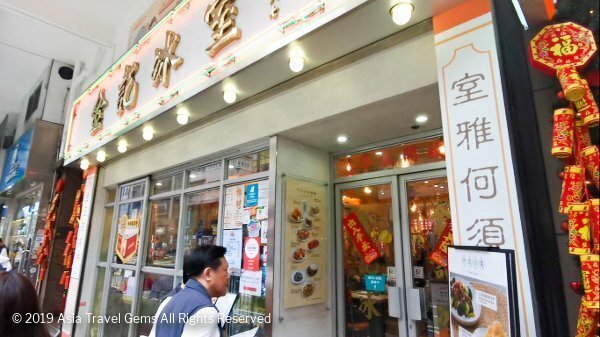 Although, technically the address is in Wan Chai, this food place is actually closer to Causeway Bay MTR Station. Alight at this station, and head for Exit B. Then walk about 7 minutes to this location. If you are not sure, which direction to head from Exit B, use the Google Map shown above. There are many buses to Tin Lok Lane. Check which bus comes from your hotel. Ask your hotel front desk for directions. If you stay at a hotel near Tin Lok Lane, then I recommend you walk over. Again, ask your hotel front desk for directions. The front desk staff at Butterfly On Morrison had a small map that was very handy when guiding guests to places of interest around the hotel. It was how they showed me which direction to go towards the cafe. Of course, if you stay far away and do not wish to take the MTR, there is the choice of taxi or Grab. For more info about how to take the taxi, grab or other ways to Get Around Hong Kong, go to my page about Hong Kong. 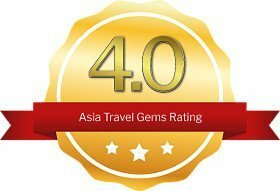 If you have ANY questions about this review, about Good Hong Kong Food – Kam Kee Cafe, ANY at all, please submit your questions as comments below. I will be happy to help you out. I enjoyed your article i’ll be sure to try the Kam Kee Cafe if i’m ever in China that deep fried fish fillet looked particularly tasty! After reading your experience though i felt like i was already there LOL! Thanks Ryan! Glad you enjoyed this review. The deep fried fish fillet is really good! I tried many other places, and they often disappoint. The fish fillet meat would be thin and too much crust. Plus, quite tasteless. This dish at Kam Kee Cafe is the entire opposite! So yummy! And the meat is thick enough to enjoy. I love it when the fish meat is thick, moist and juicy! LOL! That is awesome! I do like it when I can help readers feel as if they are already there with me on my travels. Thank you! Hi Lee, thanks for sharing such a detailed review on delicious food from Kam Kee Cafe! 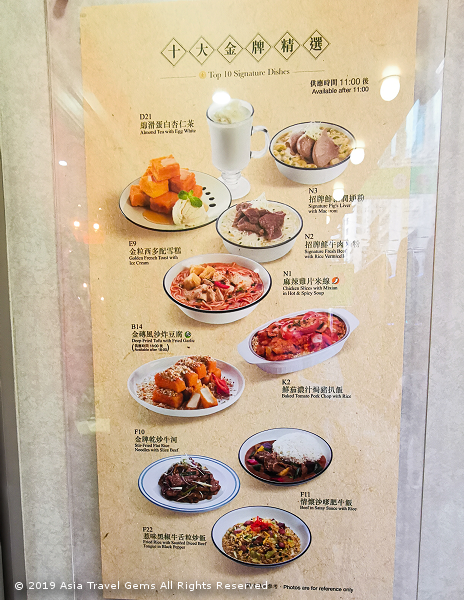 Every time i visit Hong Kong, i always find some famous Cha Chaan Teng with great foods to enjoy. I think i have collected a new hot spot to enjoy in my next trip to Hong Kong, thanks! Hi Shaun! You are so lucky to get to visit Hong Kong often. I wish I can do that too! When you visit Kam Kee Cafe, please do come back to share your experience with me. Would love to hear your view on their food. Hi Tim, I love your professional videos that give a real live look at things. I enjoyed the Butterfly Hotel one because of the detailed live look around the hotel and rooms. I am Australian and would like you to video a couple of Caucasian restaurants close to the hotel. Thanks. Hi Jill. Thanks for your compliments. The videos are actually done using my Huawei Mate 20 Pro. I am honored you find it professional. Loved this article focusing on the food in Hong Kong, and as someone who has an interest in visiting the Asia countries one day on a strict diet are there any food sources available for someone on a gluten-free dairy-free diet for health reasons in Asia? Thanks Jeff! Glad you love this review. And happy to hear that you will visit Asia soon. 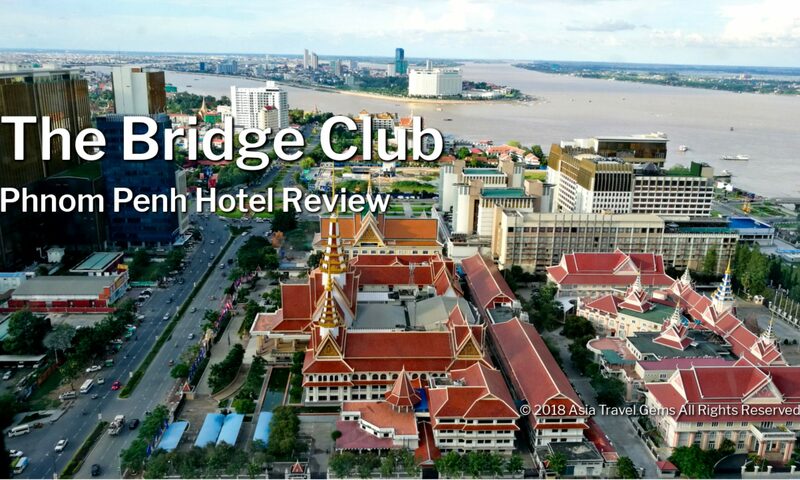 I enjoyed reading your review of the Kam Kee Cafe. What I really like about it is the way you bring things to life so one has the feeling that they are right there with you. Your use of video and photographs to give us a sense of local character and flavor is very effective. This is a fun and informative post that makes me want to plan a future trip to Hong Kong. Everything there looks so good, you must have had a great trip in Hong Kong, I would love to visit there someday. Sometimes the best eating establishments are the ones that have served the same food for years as they have been able to master the food and know what people like. I am one that always looks for the local restaurants when visiting a new place, I just find they are better. Next PostNext Things To Do in Hong Kong – Man Mo Temple – A Magical Sight!